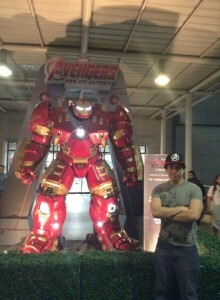 Assemble at The Avengers Experience at SM City North EDSA’s The Block Atrium! Today, theaters around Metro Manila are going to experience the much-anticipated superhero team film sequel that every Marvel fan has been waiting for, as “Avengers: Age of Ultron” finally hits theaters and sees Iron Man, Captain America, Thor, and the rest of Earth’s Mightiest Heroes reuniting to stop a new menace in the form of Ultron – a cyborg hell bent on wiping humanity away from the face of the Earth. Before or after you step into the cinemas and if you happen to find yourself at SM City North EDSA’s The Block Atrium, then treat yourself to a lively spectacle and some photo ops by dropping by “The Avengers Experience” – an Avengers-themed exhibit that showcases some impressive displays and attractions based on the film and beyond… And is absolutely FREE of admission! From April 20 to May 16 this year, anyone and everyone can see life-sized character displays and statues of characters that appear in Age of Ultron – including the titular villain, Iron Man Mark 42, Captain America, The Incredible Hulk, and the new “Hulkbuster” Iron Man armor Tony Stark developed to take on the Jade Giant! Aside from the statues on display, kids and visitors can also engage in games and activities located in the display area – including Disney XD’s family interactive game which allows you to be Iron Man, a Hulk arm-wrestling challenge game, and proving yourself worthy by lifting Thor’s hammer! Movie merchandise and items are also available via concession stands located in the activity area courtesy of the SM Store and Snack Time. 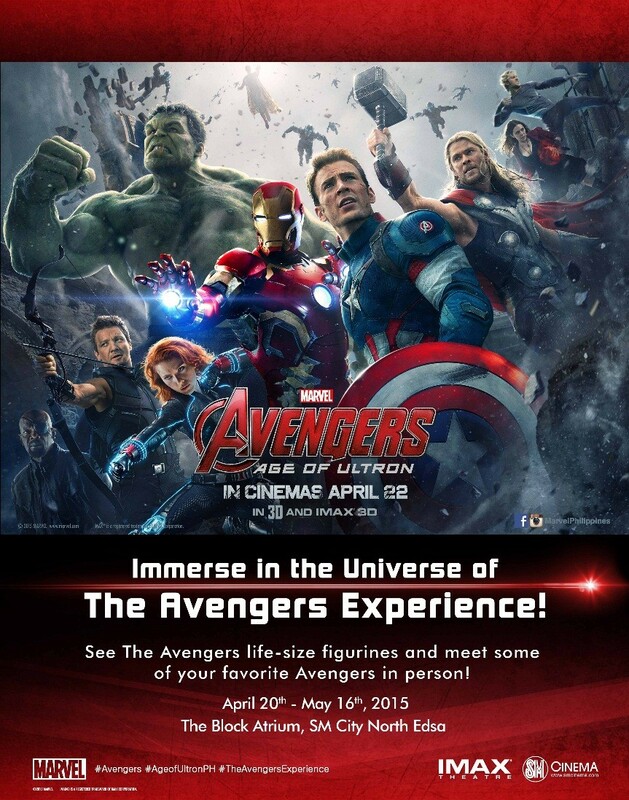 Finally, those who visit “The Avengers Experience” from April 24-26 will get to meet their favorite heroes in person! Meet Iron Man, Cap, Black Widow, and the rest of Earth’s Mightiest Heroes and get a chance to get photo ops with them by presenting an Avengers: Age of Ultron ticket from any SM Cinema, IMAX, ann Director’s Club Cinema branch! After visiting SM City North The Block Atrium last April 20 for the launch of this awesome event, I can honestly tell all fans who love and want to get to know Marvel’s heroes to go and assemble at “The Avengers Experience” – presented by SM Lifestyle Entertainment, Inc! Before you watch the movie, experience seeing Earth’s Mightiest Heroes first hand! Avengers: Age of Ultron is now showing in theaters in the Philippines!